Are you in search of qualified commercial cleaners Central London to maintain your workplace? Commercial cleaning in Central London is therefore recommended warranty a spotless hygienic work atmosphere. Several features are difficult in the achievement of any business. A hygienic place of work is very important. Organizations are one of the major breeding surroundings for germs and microbes. This might affect the health of your workers and their productivity, too. Hence, hire our commercial cleaners and see a rise in efficiency. Reasons why you should choose our cleaning company? London Cleaner offers qualified office cleaners on a day to day, every week, fortnightly or once-a-month base depending on your requests. Our cleaning teams are well taught in all features of commercial and office cleaning. All of our staff is completely insured. Our contract cleaners have references which are obtainable on demand. They are obligated to provide us with proof of address, identity and their emigration status. If they are not able to give us any references, we don’t offer them the job – no exclusions. Our rates and cheap and reasonable – See our cleaning prices. Our professional teams will carry out the contract cleaning errands with effortlessness and provide you with a spotless and healthy atmosphere to work in. Apart of commercial cleaning Central London, our company offers other services such as upholstery cleaning, carpet cleaning, window cleaning and end of tenancy cleaning. 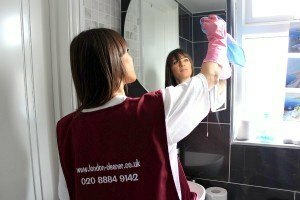 For a free estimate and more details about our services please get in touch with us on 020 8884 9142 or book a cleaner online today.